We are thrilled to be welcoming this exciting duo from the folk/roots scene to Kettering Arts centre and they will be headlining our Potbelly Folk Festival. 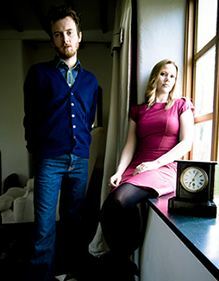 Combining the talents of northerners STU HANNA and DEBBIE HANNA, the duo Megson is fast becoming ‘hot property'(The Guardian Jan 09) on the British folk and roots scene. Originally from Teesside, the husband and wife duo met singing in the local Cleveland Youth Choir. At that time, they both had very different music career paths ahead of them. Middlesbrough born and bred Debbie has been singing since she could speak! She trained to be a classical singer, taking a degree in Music at Leeds University followed by post-graduate success at Trinity College, London, gaining a distinction as a classical soprano. Billingham born and bred Stu was playing in a pop-punk band run by an American manager who had big ideas for the band. They soon found that neither of these worlds was ultimately for them and, shortly afterwards, joined creative forces in Megson. Since the duo’s genesis in 2004 the couple have played up and down the country at numerous folk clubs and festivals, initially supporting bands such as Show of Hands and Seth Lakeman but now recently sell out their own extensive tour dates. Their growing talent was recognised with nominations for Best Duo in the 2009 & 2010 BBC Radio 2 Folk Awards. The Guardian gave their last album TAKE YOURSELF A WIFE a 4-star lead review in the Jazz, Folk and World section of its Friday Arts supplement and followed this with a major feature on Megson (both written by leading music critic Robin Denslow) THE INDEPENDENT has listed Megson in their 5 GIGS TO SEE section on no less than 3 occasions and they recently received a 4 star review for their live show from THE FINANCIAL TIMES.